Join us for Girls Gone 50’s first LA event, March 9, 3-5 pm! Imagine walking into a beautiful home and meeting incredible women who instantly make you feel valued instead of judged. You grab a glass of champagne and then gather in the living room for an intimate conversation with the evening’s speaker who just might be the CEO of a major luxury goods company, an Olympic athlete, or a panel of twenty to seventy-somethings talking about their common struggles and solutions with eating disorders. Welcome to Parlay House, the acclaimed salon series in San Francisco and New York that exists solely to bring amazing women together to connect and grow as humans, rather than transactions. And now Parlay House is coming to Los Angeles! Girls Gone 50 is proud to announce our first ever Girls Gone 50 Event for our subscribers. Join us and Parlay in LA at a special Parlay House pop-up salon in LA on March 9 from 3-5 pm. If you aren’t a current GG50 subscriber fill in the form at the end of this post. 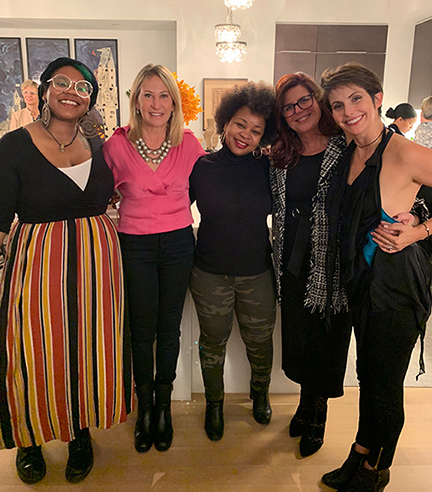 Founded by Anne Devereux-Mills, a multiple time CEO, the salon series is fast becoming a women’s movement of intellectual growth, shared joy and camraderie. Anne will get things rolling by sharing her experience of being stripped down at age 40, of all the familiar markers of success which forced her to find new meaning in her life. Sound familiar? Last week we chatted with her about life after 50. GG50: We’re so excited about hosting Parlay L.A.! As you move into your 50s and beyond, it’s even more difficult to make new connections and meet new people. Anne: It’s absolutely true. Our group started when a small cadre of women recognized that we had reached a stage in our lives where our need for connection was no longer fulfilled by our children's friends’ parents, business associates or the personal circles of our husbands (or exes). Even though Parlay House was not created specifically for women who are older, it certainly draws women who are looking for ways to be connected in a new sense of community. It’s this safe, authentic space for like-minded women to come together – and I don’t mean like-minded in the sense that we all agree – but like-minded in that we all believe in strength through connection. We come together and have authentic conversations about things we don’t always talk about as a society. GG50: It’s important to make connections with women of different ages if you want to stay connected to the world. Anne: One of the great things about Parlay House is we have speakers who are in their 20s as much as every other life stage. In one recent event, we had four women, two younger in their 20s and two older, in their 50s and 70s, all of whom talked about the battle of mental health and success. The two older women had built super successful entrepreneurial companies but struggled with eating disorders and depression. They talked about how that affected their path, their personal sense of self and their ability to lead. The two younger women had effectively formed solutions-oriented groups for people like them who were battling the same issues. So…how fantastic to look at some of the commonalities we all face through different lenses of age, life experience, sexual orientation, and race! GG50: Women at this age go through some major life transitions. We are perpetually regrouping and seeking new joy and meaning in our lives. Anne: I was in a transition when I founded Parlay House. In fact, “parlay” literally means to transition from one thing to another. But what I found is the women who are most drawn to us are acknowledging that they are in some sort of transition themselves. I think that is one of the biggest purposes that Parlay House serves. You don’t feel alone. You show up and other people say, “Oh my God, I’m looking for a new job too,” or, “I’m lacking a sense of meaning in my day-to-day world,” or “I feel like I have no control over what’s around me.” And all of a sudden other people concur. Amazing things happen. We had one panel called the Regroup. It was three women who had been expat wives in Hong Kong. They had all moved with their husbands and then they moved back and were catching up. “What happened to your career?” “Oh, it’s offline.” “What about the thing you were working on?” “Uh, I haven’t gotten to it,” and so on. They got together and decided to support each other and hold each other accountable in moving towards the things that each wanted to get back into doing. GG50: How can we feel in control of our lives while letting go of the feeling that we’re responsible for everyone and everything? Anne: When I look at my life in that sense of things I felt I didn’t have control of — I’ve had a lot of them. I made the decision to marry my girls’ dad, who turned out to be abusive and a really difficult person. I had very little dating experience and was in a relationship that I didn’t know wasn’t an example of a healthy relationship. Finally, after 18 years, I got up the courage to take control of that piece of my life and then strip it down and redefine it for myself – first as a single mom, and then, luckily later on, in a new, much healthier relationship. I blamed myself for not knowing better and for having put myself and my children through that. But I think there are times, like when I had cancer, where I accepted that it was something that happened to me that I couldn’t control and I knew it wasn’t my fault. You can’t blame yourself for getting cancer unless, maybe, you’re were a smoker. So I was able to let go of the things I knew I couldn’t control and it was very freeing. But you know, I think we hold ourselves responsible for so many things. Even my career. I was crushed after 25 years of being super successful, building companies and being a leader and then when I got sick, my boss fired me. I blamed myself. We create these false markers of what we should be able to control and what we can’t control. Could I have known that my first husband would be so unhinged? At 23 years old, I doubt it. But we set up false constructs for that, which then are oppressive. I do practice giving up control over things and realizing that bad things don’t necessarily happen when you’re not in control of everything. It’s healthy and reassuring. We can’t be in control of everything. GG50: Transitions can be voluntary but more often they are involuntary, those times when we are “stripped down” as you said. Anne: Actually the most fulfilling lives are the ones that are perpetually in transition because it forces you to think about your values and what you’re learning. In my opinion, we should be on a constant quest for fulfilling our curiosity, growing and trying things and experimenting. If not, we get set in our ways. We fail to see the world beyond our bubbles. GG50: You mean the world doesn’t fall apart when we’re not in control? Anne: Or if it does, it gets put back together in a more interesting way. Sometimes when you’re not in control, things do not go the way that you wanted them to. But what you put together, or what gets put together, as a result of that falling down is interesting, unique and sometimes better. I think a lot about the space in between what was and what will be. There are all these theories about what the past and future actually are because there really is only the present. But I do think the control piece is often about creating a future in a way that we envision rather than living in the present. And one way to loosen control comes from doing one small thing every day. It’s thinking about the day, or the hour, or the moment in smaller increments that feel intimate and connected and real without having to have the grand and sometimes overwhelming outcome. GG50: We have a tendency to feel like we’re never doing enough. Anne: This is a very interesting female quality. I see it in people whom I know in their 20s and I see it in my mother who is in her 80s. There is this perpetual comparison, not to yourself and not to the average person, but to the most successful person in that context! You always fail in that comparison. So if we stop, if we focus on our personal best or our personal story, and not just look at the one person who might be richer, or more beautiful, or more successful, or more impactful in their world, you’ll have a much greater sense of fulfillment in yours. The comparison to other women and this constant competition and holding ourselves up to impossible standards is very self-defeating. Men don’t do that as often. GG50: What about transitioning roles within a marriage or partnership? Anne: I am married to a very successful person and I have to put up with a lot of our schedule revolving around his. As a strong woman, being in that situation, of playing the supporting role by necessity to help my spouse be everything he is capable of being, feels like a weird juxtaposition of modern and old-fashioned. It kills me to this day that I am not the big breadwinner and I’m in a supporting role, even though I have financial independence because I was already successful. My husband says that his career catapulted since we’ve been together because I help him both by being a good partner and by being supportive behind the scenes. I help him make him be more successful. And I know this to be true. You have to accept the different forms of contributions. All are valid. But this allows me to run Parlay House. Because if I was running a company day-to-day I couldn’t do it. And I am totally grateful that I can. Subscribe to GG50 and receive an invitation to the Parlay House L.A. Popup!